Accounts... where did the money go? It’s getting to the time where I need to file my VAT quarter, which means I will need to go through all the receipts and invoices on the spike in my office. This is not a job I enjoy. In fact, most people just bundle it off to the accountants! But I am going to wade through it so we can accurately measure our budget. I have been reflecting on where we spent money and what can be done about reducing those costs in the future. One real problem that I have eluded to before on the blog is mobile phone charges. A few members of the crew had contracts where they had either a vast amount of time available, or even completely free calls. Most others didn’t and some people ended up with huge bills, especially in production. We did have a production policy where we expected people to be on a contract where calls would not cost anything, or negligible amounts. For some crew members this was the case. For some who were not on a contract, this was a problem. The real killers are land line to mobile, or mobile to mobile calls without a proper contract. We were seeing individual crew members bills in the region of £500! Now contrast this with ‘Urban Ghost Story’, made a few years back before the ultra proliferation of mobile phones, in production for four to six months, an office with three phones, and the total phone bill was less than £700. So phones are a real hidden cost. You need to make sure every crew member who will reasonably use a phone regularly, is on an appropriate contract, or they could easily rack up a huge bill that they will expect you to pay. I am on a contract that costs £35 a month and I get 1,200 minutes cross network free. I did exceed this during the shoot, but only just. 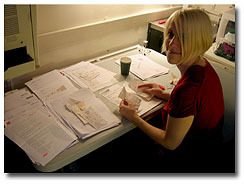 Production Manager Steph Wrate had a contract that included completely free calls. Fantastic! So just beware of this hidden cost, it could end up exceeding your entire budget if left unchecked. 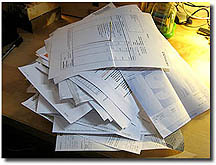 When I get through the accounts, I will provide a budget breakdown so you can see where the money actually went. Producer, Sabina Sattar, has spent the last week tallying up the budget. We have gone over budget. I knew we had so during the shoot as a number of problems came up and I just sanctioned them, saying we can figure out how to deal with it once we have it all in the can. Some of the small stuff were things like parking fines, and in our case, one very unjust parking fine. Also congestion charges, lighting consumables due to our huge camera department, a genny operator who had to be supplied with the generator who was legally allowed to handle the 80kw of power we had, catering for a crew larger than expected, shooting more film than expected... And there was one major expense which politically I cannot disclose just now, but will do so in due course. The upshot is that we are now running at around £21,500. We have almost all of post production sorted for free, and suggest we will only need a further £1,500 for that, plus some money for a full orchestrated score. My guess is that we will come in around the £23,500 mark. So far we have raised £18,500, leaving us a little short. 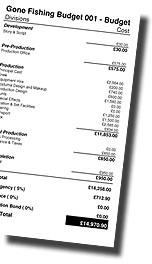 We will be supplying a copy of the pre production budget on our course, plus the full budget from the shoot (among details on all other aspects of production). This will prove to be a fascinating case study of how to spend money, where it goes, and the impact of going over budget. On this occasion, the big overage was one of those choices where I fully know we made the right choice to spend the extra cash. When you see the film, you will know just why we made that choice. I think you will agree too. If you want to come on this course about how we made Gone Fishing, get an associate producer credit on the film and come to the premiere, you can sign up here. But do it asap as we will be locking credits for the end roller soon. Traditionally, on low budget films, you always have trouble getting certain crew members. Stills photographers and sound recordists are usually toughest. We were very lucky as we had Ro Heap record the sound excellently, and Mark Reeve took the stills. I only just took delivery of Marks pictures and I am blown away. Not only has he taken the time and trouble to sort the pictures so there are no duff shots, but he also categorised them too. Mark is not a very experienced films still photographer, his professional experience encompasses photography from around the world, so this was a challenge for him – and he grabbed it with both hands extremely enthusiastically. Mark told me he learned loads on the shoot, mostly that in the stage he needed faster lenses with the image stabilisation built in. This is because film lighting is usually lower in intensity than stills lighting. These are the lenses that cost several thousand of course, but I think Mark would invest in one before his next film shoot now. Even with those considerations, Marks shots are top notch and I have never been so lucky as I have with this film with regard to stills. As the crew were working for free, I also asked Mark to take lots of crew shots of them in action, as so often they don’t have anything to document their work, or even use in a CV or webpage. Mark captured this part of the film brilliantly. I can’t wait for the crew to see these images. Today we will be working on the budget, to see just exactly where we landed, and also prepping for tonights test screening at my flat on my big cinema projector! Ye-har! Will report on these tow over the weekend. I spent most of yesterday and last night updating the schedule, which has gone through several major revisions already. 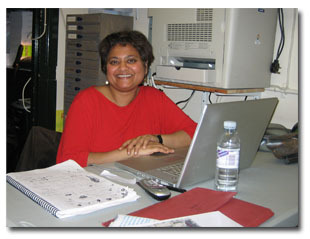 The first one was done by Producer, Ivan Clemments, who then had to leave for two weeks, and it was subsequently revised by Sabina Sattar, who stepped into his shoes as acting producer. The schedule then came back to me for my final (hopefully) revisions. I chose to actually type the schedule out manually*, copying the work that was already done, rather than use any scheduling software, as I really needed to fully get to grips with it in detail. Doing this confirmed everything I already knew about scheduling. On a cash strapped production, the director MUST be directly involved in the process, if not do it themselves. What Ivan and Sabina did was a big step in the right direction, but they did not have the advantage of knowing the shots as I did, in my head. And that’s where I was able to look at the schedule and jiggle it so that we could really maximise our shooting days. Doing the schedule is not a job for the director to delegate, more a blueprint to draw up themselves, so they know and are responsible for the resources allocated to each and ever shot and scene. Doing the schedule will make any director more responsible and less overly creative (given the restrictions). I was also aware of subtle flexibilities that Ivan and Sabine were not aware of – where one shot could be filmed in a new location for instance, and serve the same dramatic purpose. Also visual effects, background plates, photo prop shoots etc. It’s all in there now. Also, this is a movie with kids, lakes, animals, digital effects, practical effects, a 2.35:1 aspect ratio etc., all of which makes it more complex, minute by minute on screen, than perhaps a low budget feature (certainly the ones I have done at any rate). Those who are interested, we compiled the final schedule in Excel. *In the good old days in Hollywood, writers didn't have word processors and a rewrite meant pyscially retyping the whole script. That process refined the script, getting to know it better and dropping stuff that was just not needed. That's why sometimes it's a good idea to revert to the old ways.